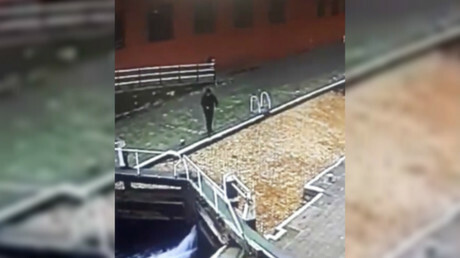 CCTV cameras outside a Nottingham pub captured the calamitous moment a man engrossed in his phone plunged straight into a canal which he mistook for a leaf-covered path. The footage was shared online by The Navigation Inn this week and it has already been viewed more than 100,000 times. It shows the unnamed man so absorbed in his phone that he is entirely unaware of the upcoming canal. He then steps straight into the water and flails about before being pulled out by two bystanders. The Inn released the footage with a warning to pedestrians to watch where they are walking after the man had to be rescued from the water. “Be careful, looks can be deceiving. The water’s not disappeared!!!! !” the pub warned. The Inn’s landlady Annmarie Gardener said patrons don’t usually fall into the canal because they know it’s there, but this time the leaves appeared to trick the man. “He thought because the leaves were on it the canal disappeared and became a path,” Ms Gardener told Nottinghamshire Live.